What does the Ignatian tradition have to offer those from different religious backgrounds and traditions? This lecture explores the question of why and how Ignatian prayer, meditation, and contemplation should be shared with members of other religions. Giving close attention to the specific challenges involved in giving the Spiritual Exercises to those from non-Abrahamic traditions, including Daoism, Buddhism, and Confucianism, Prof. Erin Cline of Georgetown University takes up the challenge of sharing the gifts of the Spiritual Exercises even with those who are not theists. 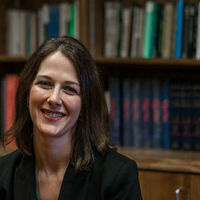 Erin M. Cline is Associate Professor of Theology at Georgetown University, where she teaches in the Departments of Theology and Philosophy, the Asian Studies Program, and is a Faculty Fellow in the Berkley Center for Religion, Peace & World Affairs. She is the author of three books and more than twenty research articles on Chinese philosophy, comparative philosophy and religion, and Ignatian spirituality, including her most recent book, A World on Fire: Sharing the Ignatian Spiritual Exercises with Other Religions (The Catholic University of America Press, 2018). This event is part of the "Dao and Ignatian Spirituality" grant project sponsored by the Robert H. Taylor Chair in Philosophy.